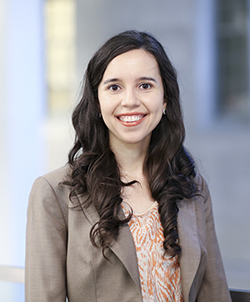 Recent Northwestern Pritzker School of Law graduate Natalie Maust (JD ’16) was named one of twenty-five young advocates in the Immigrant Justice Corps Fellowship Class of 2016. The two-year fellowship sends recent law graduates and clerks with a passion for justice for immigrants to host organizations in New York City. She will be joining the Legal Aid Society, the United States’ oldest and largest provider of legal aid to the indigent, in late August. Maust worked as a paralegal and Board of Immigration Appeals accredited representative at Chicago’s National Immigrant Justice Center prior to attending Northwestern Law. “Coming into law school, I always had that vision of going back and doing immigrant advocacy,” she said. She was encouraged to apply to the fellowship during an internship with the ACLU Immigrants’ Rights Project last summer, and was thrilled to be accepted and matched with the Legal Aid Society. The organization is contracted as New York City’s primary public defender and she will be joining a robust division focused solely on immigration. In addition to her prior work, Maust credits her Law School experiences with helping to prepare her for her new role. She also took the Civil Government Practicum, where she externed at the Chicago Immigration Court and got a front row seat to judges’ decision-making.